Today, I am throwing it back. 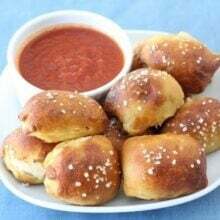 I am sharing the most popular recipe on our site, Homemade Soft Pretzel Bites. We shared this recipe on our blog in 2010 and it has been a HUGE hit. HUGE! Seven years later and it is still number one. Have you tried these soft pretzel bites? They are perfect for parties, snacking, and game day. We are making them for the big game on Sunday and I can’t wait. We love making homemade pretzels, the big ones, but there is something extra fun and special about the bites. They are the perfect party food! The pretzels are soft, chewy, salty, and so good dipped in cheese sauce! We get a lot of questions about the baking soda in the recipe. There is a 1/3 cup, yes a 1/3 cup, but the baking soda doesn’t go IN the pretzels. It is for boiling the pretzels in water. Make sure you add the baking soda VERY slowly because it will bubble up. We don’t want anyone to get burnt. Homemade Soft Pretzel Bites are fun to make and fun to eat! Make them for your next party or game day! Your guests will have so much fun dipping and snacking! Enjoy! This is the original photo from 2010. New photos are by Sarah Fennel from Broma Bakery. It is so cute that you are teaching your neighbors to cook! Sounds like fun for all of you. Love the superbowl foods! Especially the stromboli…I’m going to have to make it superbowl sunday or not. What a great idea! They look so pretty and delicious! I love the looks of your pretzel bites! What adaptations did you do to make the cinnamon sugar pretzel bites and how did you make the vanilla cream cheese frosting? I love homemade pretzels! They taste amazing. I love how cute your pretzel bites are. I am definately going to be trying these! I loveeeeeeeee soft pretzels! These look so good! I am a traditional girl and prefer them salty (vs. cinnamon and sugar). I’m excited for super bowl- we’re having a few people over- should be fun! Julie-we didn’t make cinnamon sugar pretzel bites, we just did big ones, but you can make them into bites. Instead of using salt, sprinkle the bites with cinnamon and sugar. For the frosting-mix together 3 T soft cream cheese, powdered sugar, about a teaspoon of vanilla, and a splash of milk. Whisk together. Add more powdered sugar if it is too thin, add more milk if it is too thick. I just guess:) Enjoy! Let me know if you have any other questions! Hi, they look great for Easter. Is this a sweet dough, or is it salty. We had some pretzels that wee very sweet and very unpalatable. Yum! I love to make homemade soft pretzels. These look amazing! What a great snack idea! I never thought of making little pretzel bites. Good thinking! these look so good! are they still good after sitting for a little while? We are going to a friend’s house to watch the game, and I’m wondering how portable they are. Mmmmmmmm…. I want! 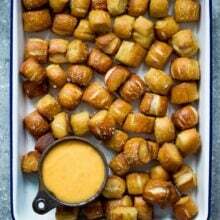 Perfect pretzels bites and YUM with that cheese sauce! Another bookmarked recipe! Excellent! And what fun teaching kids cooking! What a great idea! I might have to surprise Matt with these one afternoon for a treat. What a great idea to turn them into bites! I love soft pretzels but have never made them… they look fab! I haven’t had a soft pretzel in a while, these looks fantastic. Love the cheese sauce! I’m sure the kids devoured these after making them! It must be a blast to teach the kids how to cook! How fun for you and for them. What a perfect little party snack! How cute! 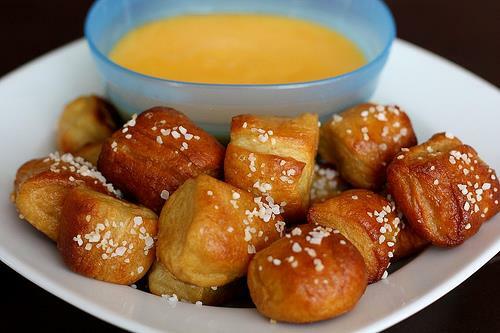 These pretzel bites look so good! Especially with that cheddar sauce!! This is a great Superbowl snack! Yum, these look really great! Perfect for a get together. These look amazing Maria! Thanks for the other links also! I’m definitely making these. Thanks for the recipe. I want to come to your cooking classes too! Great idea to make it bite size. Sounds like lots of fun making these. Love the dipping cheese sauce to go with it…yum. I have never made pretzels on my own before, i would love to try! And these sure do make a great snacking treat! Yummy! That is so cool that you get to teach these kids. So fun! There is absolutely nothing like a homemade pretzel! Yours looks totally yummy! I like mine with mustard … so good with the chewy pretzel! Awesome recipe! I love the idea of the bites sprinkled with cinnamon sugar. I’m saving this recipe for later. Great idea for Super Bowl! Yumm! since making soft pretzels a couple weeks ago i have a whole new appreciation! yours look amazing – good color. Those look so good…. do you think you can make them the day before? Or are they best the day of? My kids would love to make these. What a great snack! Aww, these are so cute and yummy-looking!! What a coincidence! I posted soft pretzels and pretzel bites today too. They were amazing and I can’t wait to make them again. I posted pretzels today too! But your pretzels bites look so tempting and I like the sauces to go with them. yum! Never had a soft pretzel before. I love cooking with my daughter – just not the mess afterwards. I can’t wait for Rory to start taking an interest in cooking. 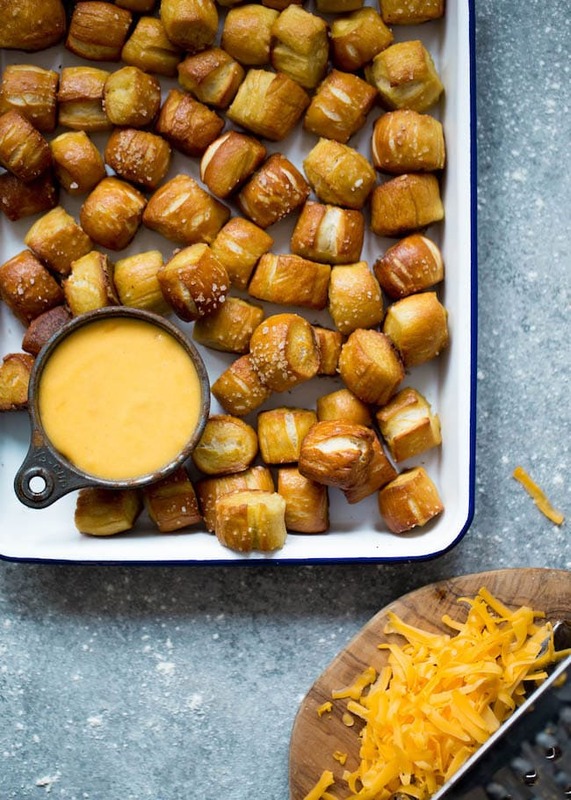 These pretzel bites sound super yummy, especially for game day. Thanks for sharing! Bookmarked – these are the perfect after school snack. I can’t remember the last time I had a hot, salty, melt-in-your-mouth pretzel. Thanks for the craving. I love this idea! Very cute blog too! Yum – they look so good! I’ve never made pretzels. I didn’t know they were boiled. They look like the perfect super bowl snack! LOL, that’s hilarious that you, Monica, Michelle, and I all made pretzels or some form of them. 🙂 Yours look perfect and I bet tasted delish! I so wish I had thought of the bits or sticks. Those look divine. I wish I could dip into the screen and plunge one into that cheese sauce. I love doughy pretzels, the only place I know in UK that seems to sell them is our cafe chain Pret a Manger and I used to buy them for breakfast on the way to work. I’ve not seen them as bites but can imagine they are very tasty. i’ll bet you’re an awesome teacher, maria. these little niblets look perfect–nicely done to all involved! OMG, I adore Pretzels of any kind, and bite sized! I am so going to make this for my Superbowl party! Those look delicious and perfect. Sounds like a good FHE treat to me! Pretzels are hot right now. Dawn of Vanilla Sugar sent me a link to bites like these but stuffed with ham and cheese. I love your sauce with these. Beautiful photos too! I just printed the recipe and can’t wait to try. My granddaughter loves the pretzel bites that are coated with lots of cheese at The Pretzelmaker in the mall. I might try to replicate those using your recipe. Thanks Maria! These look absolutely delicious. If they taste half as good as they look, it would great! What delicious pretzel bites! I’m tempted to go make some right now! 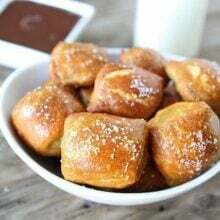 I am in the kinda mood now that these soft pretzel bites would be just perfect sitting by my side. I don’t think they would last very long. The cheddar cheese dipping sauce is a great idea. My kids would love to dip these. That is so neat that you are teaching the 2 neighbor kiddos how to cook. You are teaching them skills that will last a lifetime. I heart soft pretzels. And making it mini is even better! I am SO starring this to try for Superbowl. The cheese dip recipe is just icing on the cake. YUM! These would be perfect for the superbowl! What a great idea for game day. These sound terrific. My favorite snack in the whole world! I love soft pretzels! What a great idea. They are definitely going on my game day menu. Thanks for sharing and that is a great photo! My kids would love these! How fun you are teaching the kids…I bet you have a blast. you just made me so hungry LOL yum! These look amazing!!! I live for soft pretzels! i could go to town on those little bites! These look fantastic! I can’t believe I’ve never made my own soft pretzels. You’ve inspired me! Yum! Those look so good. They remind me of the kind you can get at the mall, but I bet they taste 100 times better. I bet a sweet version would also be delicious! That is so cool! I would have loved to take cooking classes when I was younger! These are perfect. And your photos are becoming more and more beautiful!!! Did you get some new equipment? YUM! The pretzels look great. I’ve never made bread (with yeast) from scratch. Who doesn’t love pretzels and cheese??! Just bookmarked the recipe! These little bites look so perfect. I actually made soft pretzels for the Superbowl last year. I have a feeling pretzel bites are a little less time-conusiming. Great idea! I am totally going to try these! I was searching for Super Bowl food ideas. This looks like the perfect choice on Sunday. Thanks for sharing, Maria. Oooh wow they look great! Thankfully super bowl we have all decided to meet at a local bar for wings. I am a huge Colts fan and I really did not want to spend the entire super bowl in Jeff being nice and a good host. Awesome job! I love soft pretzels especially if the dough was made with jalapenos. drooll……..
Yum! I would have never thought it possible to make pretzels at home, just seems like an impossible task in my mind. They look so good and I love anything in a small bite! Can’t wait to try this recipe. Looks great Maria! Dipping little bites of goodness in cheese is one of my favorite past times. 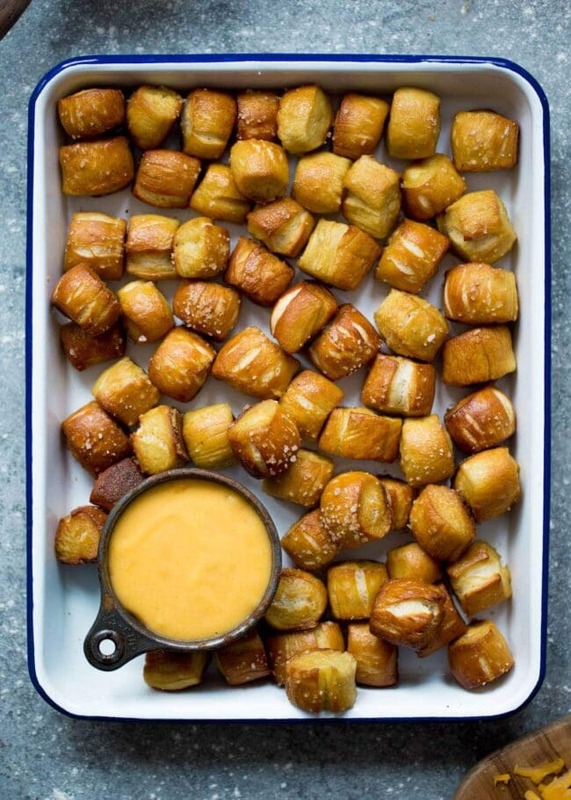 Wow, these pretzel bites are calling my name. I was just looking in our cabinets for pretzels last night! Love the Pretzel bits…you can dip more! LOL! Oh these look too dangerous for me to make at home. Yum! I would eat them all in one sitting. Yummy – I am totally making these this weekend! Our fmaily loves pretzels, and I am excited to make some homemade! Yum! Question: how did you store them to retain the first day’s freshness? I made some pretzels recently that were delicious day 1, but they lost some of their perfect consistency after a night or two in a tupperware container… Thanks! I’ve never made pretzels but those pretzel bites make me want to! Jami-the kids ate them the day we made them. I would reheat them in the oven if you want to enjoy them the next day. Reheat and stir the sauce too. ohhhhh….delicious….I have made pretzels before (were a favorite breakfast dish for my kids)…but bagel bites I have not made…yet…and just in time for superbowl sunday, too. Thanks for sharing. Those look really yummy. I bet my girls would love them. I’m really tempted to make some this afternoon. These look fabulous… I must try them soon…. I’m drooling! Those look great! The bites I might even get my five year olds to help me make, thanks! I want to snack on some of these! Looks great Maria!! I just tried these and they were pretty good, but they tasted a lot like baking soda? Did I do something wrong or is it possible to cut out the baking soda? Pingback: Healthy Food Ideas for Super Healthy Kids » Buy Local, In season food for better health! I just made these to take to a potluck lunch and I’m afraid there aren’t going to be any left for me to take in a moment! They are addicting! I brushed them with butter and skipped the cheese sauce, but I’m sure it’s yummy too! Hi, I just tried the soft pretzel bites and they tasted like baking soda. Do you know what I did wrong? I thought I followed the recipe. Hmm. Our pretzels have never tasted like baking soda. after you add the baking soda maybe wait a minute or two before adding in the pretzels. Sorry you had struggles. Oh these look yummy!!! Question though…do you think i could sub some whole wheat flour for some or all or the apf in this recipe? Yummy! And what a great size to dip in chocolate, eh? I made these cuties today and they taste AWESOME! I searched for recipes all day and came across this simple recipe. Thank you! The first time i made these they tasted too much like baking soda, so the next batch i made, i just put a little bit of baking soda in the water and they tasted great and still soft! Hi – was wondering if these freeze well? I wanted to make & then freeze to put in gift baskets for Thanksgiving. I have never froze the pretzels before. I am guessing they would be fine though. Let me know if you try it! Thanks! YUM! And thanks for the recipe! Such a great idea to teach cooking classes to kids…that may be something I could do in my neighborhood! Do you charge? This is a fantastic recipe. I tried it over the weekend and it turned out perfectly – with any recipe like this though, I am always careful to make sure not to overcook. My oven is a bit on the older side and that can lead me to problems if I don’t keep an eye on things! wow, looks absolutely yum. I must try those pretzels gluten free. My kids would love them. Are you sure it shouldn’t be 3/4 TSP of baking soda, not cup? The baking soda goes in the boiling water, to boil the pretzels. I hope that is clear. Enjoy! I just made these and having grown up eating Philly pretzels, I say, “yum”! For the people wondering about too much baking soda, I hope I don’t offend you when I ask if you are using the baking soda in the boiling water bath? Baking soda does not go in the water that the yeast is being dissolved in, only in the water that the pretzel dough will be dipped in for 30 seconds or so before baking. Mine did not taste at all like baking soda. I just hope my family doesn’t eat them all before our guests arrive! Glad you liked the pretzels. The baking soda goes in the boiling water to boil pretzels!!! You are right! So glad you liked the pretzels! Yay! What I did was to coat them with cheese and bake them, giving them a stronger cheese flavor and a little crunch. I really want to make these for my book club Friday night but won’t have time to do it right before. Are they still good the next day? If prepared the day before the event? I am sure they would still be fine, just put them in an air tight container. Ours never last until the next day:) Have fun! Hmmm – these look super super delish and like they would make for THE perfect game day snack. I too was wondering about making them w/out using a stand mixer b/c I don’t own one. Do you think the dough could be made in a bread machine on the dough setting? I don’t have a bread machine and have never used one, but I am sure it can be done! Give it a try and let me know how they turn out! Thanks for visiting our site. I make all my yeast dough recipes in the bread machine, whether the recipe is a “bread machine” recipe or not. It’s just a machine. So long as your flour amounts in the recipe do not exceed what your pan can handle, go ahead! Thanks! I just got my machine last week so I’m still new to it all. I’d much prefer to dump the ingredients and then move onto something else while it prepares the dough. I’ll give it a try and let you guys know how it goes. I just made these! After baking, I dipped half of them in a little bowl of melted butter then a bowl of sugar and cinnamon. YUM! The other half I will dip in honey mustard sauce. Thanks! Caroline-I am so glad you enjoyed the pretzel bites. Great idea to do sweet and savory! Thanks for the recipe – is the baking soda off – I only used half and they are super strong tasting still – plus the water boiled up all over the stove when it reacted with the baking soda. The baking soda is right, I adapted the pretzel bites from Bobby Flay’s pretzel recipe. You need the baking soda to achieve the brown, chewy crust on the pretzels. Add it slowly to the water. We didn’t taste the baking soda. If it is too strong for you, try using less, but you do need it. These look sooo yummy! Will give it a shot soon!!! Thanks for posting! I made this today and they came out AMAZING! This will be great for parties and such! My husband loved them! Thanks for sharing! Sarah-glad you had success with the pretzel bites! Thanks for letting us know! Pingback: Homemade Pop Tarts and Pretzel Bites – Part 1 | Is this Eatable? These are seriously addicting! So easy to make, too. I just made some for a friend for her 21st birthday, it was a nice variation from traditional birthday goodies like cake and cookies. Instead of plain coarse ground salt on top, I sprinkled them with coarse ground garlic salt- added a slightly different flavor,so tasty! What do you mean by “package” of yeast? It is 2 1/4 teaspoons of yeast. The standard packages of yeast sold in the store. Most conversions list this as 2 1/4 tsp of yeast. I made these today. A big Hit! Very yummy. Vanila cream cheese frosting? Your the devil. These were amazing and every family member who stopped by the house this week ooh’d and ahh’d over them. I haven’t been able to get the cream cheese frosting to come out for the cinnamon and sugar ones. When you say to add powdered sugar is it a little like a few tablespoons or a lot like a cup? I am still learning to cook and am not good at guessing yet. Thanks for your help! I made these for a party last night and they were great! I was surprised at how easy they were… I’ve made yeast-bread once before and it seemed a lot more complicated, so I was pleasantly surprised that this was pretty simple. We had three of us doing the actual rolling/cutting/boiling/brushing egg, which was a good system… I think it would have been a lot harder/longer with just me! Glad you enjoyed the pretzel bites. Thanks for letting us know! I made this recipe tonight and it turned out wonderfully! They were so amazing! Growing up my best friends mom made homemade pretzel bites and I have since tried duplicating the recipe, I finally found the one! My only thing is, and maybe it’s because I live in Colorado (High Altitude problems) I need to turn the oven down. The pretzels were perfect on top and almost burnt on the bottom, and that was even after I reduced the cooking time by 3 minutes. Absolutely delicious nonetheless! Everyone should make these, so easy! So cute! I definitely want to make these…looks really delicious! 🙂 Love them. Would it be possible to make it in advance (possibly freezing it)? If so, how? I haven’t tried freezing them, but I am sure you can. You can either freeze the dough in a ball or cut the dough into the bites and freeze them. Let us know if you try it! Made these today – so addictive! Thanks for sharing a great recipe! I’m sure this will be requested for every football game I attend. You are welcome! The pretzel bites are great for game day! LOVE them! sooo soo so Good! thank you! Pingback: These links were made for sharing. « All I Eat Food! Thanks for the recipe, but it says (3/4 cup baking soda), cup? All this time, I have only been buying the boxes of frozen soft pretzels. These are SO delicious, I have made them twice within a weeks time! They take some time, but the work is actually very minimal and the results are amazing! these are AMAZING, after i made them they were gone in 5 minutes! I just finished making these and my husband and I really liked them! I posted a picture of the bites on my website http://www.quiltingwonderland.wordpress.com. I’m going to have to try these, I love pretzels!!! I think I may be addicted. I also think it’s awesome that your kids like to cook with you, you are making fantastic memories that they’ll remember forever! If I don’t have a stand mixer (I know, shame…lol) could these be made my hand? I would love to have these for NYE. YUM! Just made these for NYE. I am going to get fat. And I am not sure if my guests will get to try them. THANK YOU! How much yeas is in the package? And should I use kosher salt or can i use some other salt? these look great! I love me some soft pretzels! can you use instant yeast instead??? Just made these tonight and they turned out amazing!! The dough is amazing! I love it! But the everything about the boiling was worthless…the baking soda made them taste nasty and the water will make them super soggy if you let them soak for to long! Sorry you had trouble with the recipe. We love the pretzel bites. Just wondering what is exactly a package of active dry yeast??????? I have a jar of about 4 oz, do I need to only use like 2 tablespoons???? I haven’t used yeast in a recipe yet, so I don’t want to mess up the pretzels. They sound delicious!!!! 1 package of yeast equals 2 1/4 teaspoons. Made these last night and they are yummy, though I found that I could only eat three or four bites because of the bitter aftertaste. Is it possible that something went wrong? We’ve never noticed a bitter aftertaste. Not sure what happened. Perfect timing! Our church has a bread auction every year on Super Bowl Sunday and these will be a huge hit! One question – your recipe states that it ‘makes a lot of bites.’ I’m going to be a pain and ask approximately how many? I need to make ‘one to taste and one to auction’ so I’m wondering if one batch will be enough??? Thanks! I have never counted, sorry! I am going to guess around 50ish? Tried these and I think I’m in love! Thanks for the idea…and the Sugar Rush! I want to try to make these on Sunday for the Super Bowl, but I don’t have a stand mixer with a dough hook. Would I be able to make these by kneading with my hands? If so, how do I do that? I haven’t made a whole lot of dough so far, so I’m not sure. Thanks! After reading the reviews about the baking soda, I was nervous that mine would taste the same, but I am glad I lietened to myself & made them anyway. I used about 1/2 of the called for baking soda (still in 3 Qts water– maybe that is what others have missed?– the soda:3QUARTS H20 ratio?) Anyway, they came out great!! I would definitely not pass up the “greased cookie sheet” memo, I usually ignore that, and did the first batch too– which was a mistake ): But they still tasted great! Thanks! Mad these this afternoon. They very very good. I usually make the tradition pretzel shape. I’m just going to make these nuggets from now on. So much easier. Thanks. Glad you liked the pretzel bites! how many grams of yeast do you use? you only comment on a package… or if we use powdered yeast how many grams should we use??? 2. Use more water with the baking soda, Im not sure I used enough so I got some of that taste on my pretzel. 3. DONT use too much salt on top!! 4. I totally turned the oven on WAYYYY to early, so my pretzels were done in about 14 min. you never say when to use the baking soda which you mention on the ingredients list. Also how long should this dough be kneaded for? You add it when you boil the water. You just knead the dough by hand until if forms a ball. Wish I had seen the comments about the baking soda. I also made them for the superbowl, they looked beautiful but were unedible. I will have to try it again. Thank you for this recipe. I made them today and they were a tital hit. Delish! Made these with my daughter for the Super Bowl and they were a huge hit. Thanks so much! I am from Dallas TX and in all of the Malls we have a Pretzel place called Auntie Anne’s and they have AMAZING pretzels. The reason they are so amazing is cause they do all the different toppings like Garlic Parmesan and my favorite, Sour Cream & Onion. I live in Tyler now and ALWAYS crave soft hot pretzels. I know that now thanks to you, I can make my own Auntie Anne’s pretzels. 🙂 I am thinking of using the powder to make the sour cream and onion dip as the topping to see if that matches Auntie Anne’s. YUM cant wait!! Thanks!! So I tried making these last night, and I followed the recipe to a T. The dough smelled great, just like a pretzel dough should. After they were baked, they came out of the oven with baking soda around the pretzels (they were golden brown just had white dust all over them). They tasted great when you first bit into them too but after a few seconds they tasted soapy and had a horrible after taste. I want to try to make these again because they look delicious and now Ive been craving them, any suggestions as to what might have gone wrong? I’ve tried this recipe twice now, and it’s AMAZING. These are gone within a couple of hours of being made. I’ve also made full-sized pretzels out of the dough, and that works beautifully, too. If you do try it, just be careful when you add the baking soda to the boiling water. The second time I made these it bubbled like mad and overflew all over the stove, haha. My mistake! I would say to just stir in the baking soda at the beginning and let the water come to a boil with it already in there. Delicious recipe! Will definitely make lots more. I just made these yesterday and they were amazing!! All 4 kids loved them. Will make them regularly and no more mall pretzels for us. Thanks so much!! I wonder if you made them a little bigger they would be like the Sister Schubert pretzel rolls – worth a try. 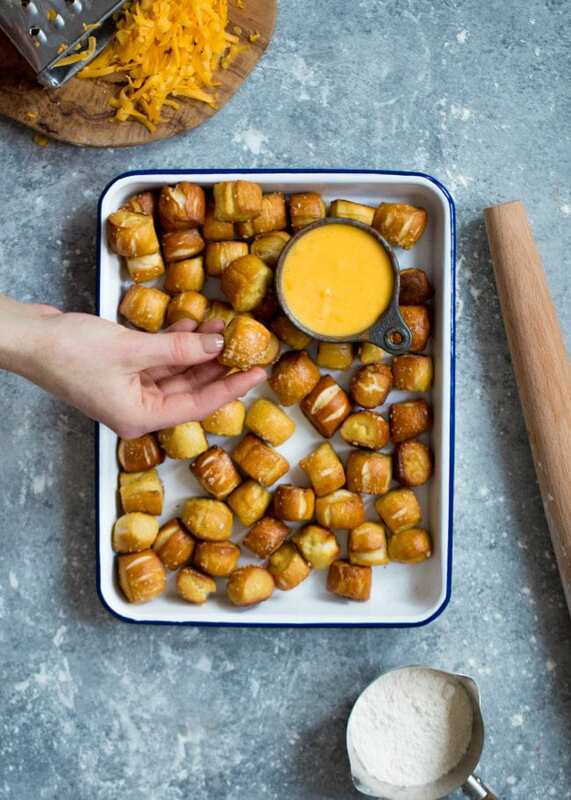 I have a question: I have made these AWESOME pretzel bites twice now. The first time was a huge hit with my family. This last time, however, the bites “felt” fine texture-wise, and tasted pretzely, if that makes sense, but they had a VERY bad aftertaste. Is there anything specific you could think of that might cause that? I’m wondering if I overhauled them, because the last cookie sheet full I baked was much better, and I only had them in for 14 minutes. Suggestions? Tried these and they’re great! Thanks for the recipe! I just made these and while the dough is delicious, 3/4 cup of baking soda was WAY too much. It rendered the pretzels almost inedible. I made these with the intention of having them as a treat for my guests that are coming over in an hour. I seriously just ate almost all of them, so my friends are getting chips and salsa tonight instead haha! It’s a perfect recipe! Just made these to share with the teens I work with at church. They are delicious! If I do not have a dough hook, how can I mix the dough? You can knead the dough by hand! Thanks for this awesome recipe! I’m a little bummed because I too had the disgusting baking soda taste! I wonder what makes some of us have it and some not? I made homemade pretzels before but used whole wheat flour and didn’t use baking soda. They tasted fine but were not very appealing to the eye. 🙂 Did you use a certain brand of baking soda? Did I soak too long? I’m baffled! Ale more. They are amazing! I wonder if they are freezable? Yes, you can freeze the pretzels! Glad you liked them! I have made these twice now and have ‘baking soda’ issues both times. The first time the water foamed up all over the stove–it was a mess! The second time used a different pot (a tall soup pot )but the water was so foamy that it was hard to find the bites in the water, it took two of us-one scooping and the other ‘blowing the foam down’ trying to keep it under control. After reading the comments, I am wondering if 1)the type of pot used is making a difference (aluminum vs other metal) or 2) if the water is boiling down to quickly making the water/baking soda ratio off or 3) if there is a difference if using ‘soft’ or conditioned water? Just trying to think thru the process to understand what could be causing the different reactions. The first batch tasted great, the second were still yummy, just a bit ‘baking soda-ish’ but with the dips, we still ate them all. cheese dip, marinara, honey butter, cinnamon syrup, etc…. would appreciate feed back as the whole family is really anxious to get this down as they are now our favorite Family Game Nite treat! Sorry you had issues. We use a stainless steal-large soup pot. Add the baking soda in slowly. We use water from our faucet, nothing special:) I hope this helps. I am really not sure why you had such differences in the batches! Not sure why the differences either, but we will be making more! they are just to yummy not to. thanks for the feedback. how high of a temp do you keep the water at once the baking soda is in? a high full rolling boil or a lower ‘simmer’? I wish I could come bake with you so we could figure it out:) We do turn it down a bit, probably to medium heat, but the water is still boiling a bit, just not going crazy. I hope that helps! I’m wondering if this recipe is possible without a bread hook. Also, do you have to use unsalted butter? Tried them out. Yummy!! but quite salty. Just made these this afternoon for a snack – SO good! As in, Hubby and I probably ate enough for them to count as dinner! Glad you liked the pretzel bites!! These were so easy and so amazingly delicious. I cannot believe how many it made. I stored them in a ziplock bag overnight after completely cooling the pretzels. The next day they were not nearly as tasty. The salt kind of dissolved into the pretzels. Any recommendations as to storing the leftover pretzels? I was thinking of freezing them right away and then re-heating them in the oven. The pretzels probably got too moist in the bag. You can put them in an container and crack the lid or leave them out. Freezing will work as well! This recipe is delicious!! I have the WORST luck w/dough (rising problems, usually), but this was so easy! I just made some today, and wow, I cannot stop eating them- thanks for posting! Love this idea! How can you mix the dough without a stand mixer? Anyway that you’re able to replace the oil with something else? I now I could use different oil, but anything else besides oil and butter. These. Are. Incredible! We could not stop eating them! So a batch of these feeds a family of 6, including younger kids. I suggest making a double batch if you’re even close to running low, because they are that good! Thank you for this recipe! I’d love to join your cooking class! Any chance you’re in southern Michigan? Thanks for the awesome recipe. Can’t wait to try it. 3/4 cup of baking soda? seems like a lot! Any tips for those of us who don’t have mixers and are hand kneading the dough? Are any alterations required for this? Love the blog!! Made these for a football game and they were delicious – thanks so much! When I started to make the cheese sauce I realized my milk was sour. I could use evaporated milk, but decided to use beer and it was really good. Just a quick question- even though I know this is an old post. About how many pretzel bites did this make? I’m making them tonight to bring to my work tomorrow, but I want to keep some at home, too. I need to know if I should double the recipe! Thank you!! Made these today as the inaugural use of my new stand mixer. I used less than 1/2 c baking soda (because that’s what was left in the cupboard), and after reading the comments I’m glad I did. They came out wonderful. Warm are definitely better than cooled, and I didn’t make the cheese sauce but may in the future when it’s more than the two of us gobbling them up. I’m so happy I found your Pinterest boards! I don’t have a stand mixer/dough hook. Can I use a hand mixer for combining butter, yeast, water and sugar…or does that get kneaded together too? Going to make these for Christmas and don’t want to mess it up. Help! I just found this website and was in love with the best of 2012 recipes. Last night for our New Years party we made these pretzel bites… Awesome- just like the ones you buy at your favorite sporting event… And we made the guacamole grilled cheese sandwich- again so good. You are very welcome! So glad you found us! I know this is one of your older recipes, but I made them when my friend called me the day before his NYE party and begged me to bring some snacks because all he had were frozen pigs in blankets. They were fun to make and a huge hit at the party! Great recipe, love the blog!! I plan on making these this weekend, but had a question about the cheese sauce. I know it’s been a while since you made them. It looks like the sauce stayed liquid-y outside of any heated container in your photo, but I’m not sure how long that lasted. These will be made at home, brought to a party, then sit out at the party. Do you think that will be a problem (i.e. cheese sauce will get hard / lumpy / separate)? If so, I’ll just plan to bring a different dip with the bites. The cheese sauce will harden as it cools or if it’s refrigerated. You can always heat it up in the microwave on on the stove. Stir it up and it should be just fine. Wow, I am impressed but sadly I can’t find any pic of the sweet pretzels with cream frosting. Would love to see this one! So I made these from a slightly different recipe — almost exactly the same and they turned out very wrong… they were done on the outside and doughy on the inside… when i let them go longer, the outside just got burnt and the inside stayed not completely done… any idea what i’m doing wrong? i would really love to make these and have them work! You should try our recipe:) You can use Kosher salt if you can’t find sea salt. I just tried these for Super Bowl Sunday. It seemed like a large amount of baking soda, and I felt like I could taste the soda on the pretzels after baking. Is it possible to do this with less baking soda? The pretzels are amazing. My kids ate them up. Thanks for a great recipe. I will definitely make them again. Question? I made the cheese sauce, too, but mine turned out grainy. Any idea what I did wrong? I made these last night and they were delicious! The cheese dipping sauce was amazing, as well. I didn’t realize how strongly baking soda would react with boiling water and dumped the entire 3/4C baking soda into the water at once. Ooops! Haha. Learned my lesson for next time. Great recipe, my husband told me I have to add it into the rotation. These were good but I think the temp is a little too high. The tops and bottoms were basically burned and the inside was still a little doughy. Will make these again using a different temp but thanks for the recipe! Do you’ve any? Kindly let me recognise in order that I may just subscribe. Thanks. They look really good, but does the water solution really require 3/4 cup of baking soda? That seems like way too much! I’ve cut it back to 2/3 cup and it works just fine. These were so good but a little on the salty side. 🙁 I don’t know what exactly went wrong there……….. I made this and they came out perfect! I just scaled down the water to 2 qts and used 1/2 cup. of baking soda. These came out incredible!! I’ve always had bad luck making anything that involves yeast but everything went perfectly with these. The only thing I found is it only took 6-6 1/2 minutes for them to finish baking. My husband said these were so much better then the ones that we love to eat at our local mall. To me that’s the highest of compliments 🙂 I’ll be making these many more times this fall/winter. Next time I’ll try the cinnamon/sugar ones! I made these tonight and what a success! 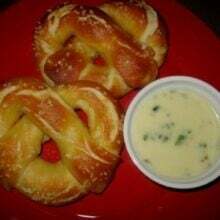 Thank you for such a simple easy recipe, but after looking at other pretzel recipes I’ve noticed they all require much less baking soda in the boiling water… I’m wondering if 3/4 cup is really necessary? Because I plan on absolutely making these again! Thanks for sharing. Can the dough be frozen? If so, at what stage in the recipe can the dough be frozen, eg. before/after the dough rises, after boiled & cooled…? Or is freezing not recommended? You may have answered this, but how long can you store them before eating? If you divide the dough into 8 pieces, roll to 22″ and cut into 1″ segments, it will yield over almost triple the amount indicated, 14-1/2 dozen pieces, not 5-6 dozen. I may try this for Christmas, but I think I’ll at least halve the recipe. Just made these and they turned out wonderful! My whole family inhaled them as quickly as they came out of the oven. I’ve failed at a lot of pretzel recipes in the past, but these were pretty easy 🙂 Though my cheese sauce solidified really quickly. Thanks for sharing. Do they need to be baked immediately after boiling, or can I get them that far, then wait a couple of hours to bake them? Just made these and they came out great!!! I used to live in Jersey where we had the Philly Pretzel Factory chain by us. I used to buy a box of rivets every sunday for football. These came out delicious. I no longer miss PPF, I can just make them myself!! I cursed this recipe the whole time I made them because they were more work than I wanted them to be and led to a very messy kitchen! In my head I just kept saying, “never again, pretzel bites!” They came out perfect and are delicious!! Well worth the trouble. I’ll make these again and again!! I don’t have a stand mixer is there another way to make them? I just made these! What a great recipe. Easy, quick, and fun. I used the same batch of dough to make both cinnamon sugar and salty pretzel bites. I am also a vegan, so I simply used vegan butter (Earth Balance) in the actual dough and in replace of the egg wash. Thank you! I think it means ‘breze’ and not ‘pretzel’ …. These look soooo good, thank you for posting this recipe. I’ve attempted in the past to make pretzels but disasters we’re all I ended up with. I am definitely making these. Made them last week and they turned out fantastic!!!!!!!!!!!!! Not too thrilled with the cheese sauce but I don’t think that matters much. Do you think you can make the dough in a bread machine on the dough setting? I haven’t tried using a bread machine, but I am sure it would work! Any thoughts on how these would turn out using gluten free flour and xantham gum? I am still new to the gluten free cooking. There are two different measurements for water. Which one goes into the mixer and which one do you boil with the baking soda? Just wondering if this dough could be done in a bread machine? I have horrible wrists (from 10 years of hairdressing), and wouldn’t be able to kneed a dough. I am so excited to make these! What are your thoughts on freezing? I am wondering if I could freeze them after I bake them and then reheat them in the oven. Thanks so much for a great recipe!! One big mistake in the recipe! 3/4 cup of baking soda is way too much and will make very bitter pretzels. 2 tbsp. baking soda to 1 gallon of water is the proper amount and gets the job done very nicely. The pretzels were great fun to make and serve with lots of different mustards. Would it be possible to post a recipe conversion for this that uses whole wheat flour? Hi! Have you tried to freeze these after making? Just curious on how they would be 🙂 Just made the first batch, and they are in the over! Can’t wait to eat!! My son and I made these as a snow day snack. It was a great activity – hands on, broken into steps where everyone got to take a break, and delicious. My son helped mix the dough, roll and cut the bites, and do the egg wash and salt. I used about 5 1/2 cups of flour to get the dough to a good consistency. I had no problems with the baking soda, but did cut the baking time back to about 14 minutes. We’ll definitely make these again! Just made these, with no variation to the recipe and both myself and my wife have agreed that if it weren’t for the amount of baking soda that went in to the water it would probably have tasted better. I think the next time that I make them I will dramatically reduce the amount of the baking soda in the water. This recipe looked amazing! But when I tried it, the 3 quarts of water along with 5 cups of flour was awful. It was all runny. It is not physically possible to mix those proportions and end up with dough. It was more like soup. I think you may have meant 3 CUPS and not 3 QUARTS. I wasted SOOO many cups of flour for this. VERY VERY DISAPPOINTED. The 3 quarts of water is for boiling the pretzels. You only use 1 1/2 cups of water in the recipe. Tried them did not work so great I must of messed up on the dough. But a lot of work. Why do u boil them ? Just came across these and I’m definitely going to attempt them! How well do they keep and should I put them in the fridge or keep them out on the bench? Going to make them for school lunches. They are excellent!! Thanks for sharing!! How long do you think the unbaked pretzel dough is good for if not cooked? And should the dough be refrigerated? There will be a whole lot of dipping with these tasty bites. I am so looking forward to making these, and I hope to transport them to a party. Any tips on keeping the cheese sauce smooth and warm during transport, so that I don’t have to heat up the sauce at the party? I fear making these and having a cold congealed mess of cheese alongside! You might have to heat it up at the party in the microwave when you get there. You can also serve it in a mini crockpot. These didn’t turn out like the picture at all. Was not happy. Does it say how much vegetable oil to put in or am I missing it?? Have you ever done this with egg replacer? No, but I am sure it would work. Let me know if you try it! I copied this recipe some time ago and it read 3/4 cup baking soda, I made them yesterday and all you could taste was the baking soda. I had to throw them all away. It took a lot of time and expense for nothing. We love these pretzel bites! Cinnamon and sugar are my favorite, salty/savory are my husbands. These are great as a snack or part of a meal! I rate these 5 stars! can I make and bake these ahead and freeze them ? What a great recipe! I made this last night for some company we’re having tonight. I had no idea making pretzels was so easy! They are so good too! My husband was in love! Thanks for sharing the recipe! These were a tasty snack and definitely a fun activity to make with friends or kids (or both!). Six dozen is a lot of pretzel bites, but these can be saved in ziplock bags for lunches throughout the week. On a downside, there was a slight metallic taste, which I think was a result of the baking soda boiling water mingling with my fillings. I’ll be seeking out ways to avoid that experience in the future. I don’t have a bread maker so I haven’t tried it but I am sure it would work just fine! These look amazing & I want to try them. Has anyone ever froze them, if so how did you do it and did they taste the same? Can you make the dough one day ahead? What a great recipe! Husband and children approved. Love the feel of the dough. Thank you! These look delicious! Could I dump the ingredients in my bread maker and skip the steps leading up to rolling, boiling, and baking? I made these tonight for a Super Bowl snack. I made them into the bite size. The recipe made about 40 pieces. They were AMAZING! They were soft on the inside with that perfect soft pretzel “skin/shell” on the outside. I made a cheddar cheese sauce for dipping. Easy and delicious! These were easy to make and a hit. My kids ate them like they were the best thing ever. These were delicious! Paired them with cheese, honey mustard and spicy mustard. Yummy! I made these this weekend for a Super Bowl party and they were such a big hit!! Just a tip for people trying this (and maybe this is common knowledge but as someone who usually avoids the kitchen, I had no idea!). Either use a very large pot or add the baking soda VERY slowly. I didn’t know this and made a huge disaster when it bubbled up and spilled all over my stove…eek!!! Stove was fine, lesson learned, and pretzels were so delicious!! Thanks for such a great, easy to follow recipe!! Your recipe mentioned a half cup of baking soda. But there is no mention of it in the actual recipe. Just add it during the flour step? So delicious! My husband says they are better than any ballpark pretzel! These came out fabulous! I will definitely be making these again!! I finally tried these yesterday. The pretzels were delicious. I brought them to a dip-themed potluck and they were a big hit! The only thing was – they were really misshapen! We found it hard to work with the dough after letting it rise, so when we tried to roll it out, it was just too tacky. We eventually gave up trying to make nice uniform bites and just settled for pretzel “blobs,” as we called it. They were still delicious, but I’d love to troubleshoot what went wrong. Any ideas? I let it rise much longer than the recipe listed because I was in the middle of making many recipes and had to hold off. Could that be it? Or should we just have kept adding flour? I love this recipe and so appreciate you sharing it. 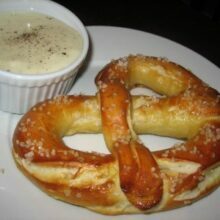 I am going to tackle this recip tonight but I’d like to know if can use this recipe to make soft pretzels rolls. They look really good and delicious! Do you really need a 1/2 cup of baking soda? I found this recipe on Pinterest and tried today. They are delicious! I experimented and made a few traditional pretzels and a pretzel roll, and all came out great following the same instructions and cook times. (The pretzel roll was about 1/8 of the dough, and the pretzel shapes were about 1/16 of the dough.) I made some with salt and some with cinnamon sugar. The only thing I would do differently is wait until after the bites come out to put on the cinnamon sugar. I sprinkled it on before baking, but it completely burned in the oven. Next time I will brush with butter when they come out, then sprinkle with cinnamon sugar. Otherwise these were so good and the recipe was very easy to follow. Both ways would work. I guess it depends on how much time you have that day! These look amazing! And much less difficult than I’d imagine. I want to make these soooon. 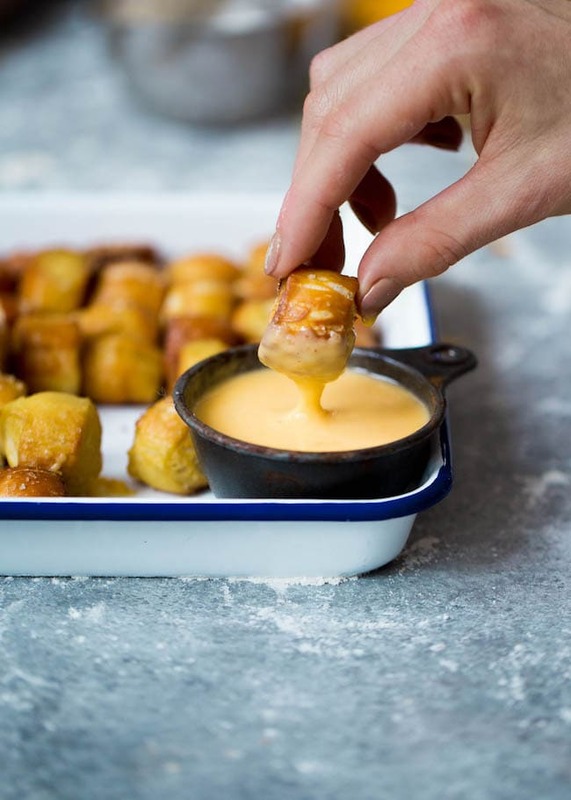 I like dipping my pretzel bites in nacho cheese so it has a bit of kick! I need this in my face. Hello! I’m hosting a party tomorrow and I am trying to do as much in advance as possible. If I make these today and serve them tomorrow, do they keep well? Of course, they are best right out of the oven, but they will keep until tomorrow. Have fun at your party! These pretzels are Amazing! They turn out perfect every time. The cheese sauce is equally delicious. My family requests them frequently. Thanks for sharing this recipe! I am so glad you like the pretzels! I made these today.. a little bit of work, but if you have time very good. I wish they had said what would happen when you put the baking soda in the boiling water !! OMG ! the pot totally overflowed with scorching hot boiling water !! all over the stove, down the sides, on the floor, into the door of the oven which is now ruined with baking soda drips !! Not sure what the purpose of this was, but it totally ruined my day. Not only did I have a huge mess to clean, but I now have a permanently stained oven door to look at. Not very happy at all. Cheese sauce was a disaster. The first 2 batches I baked on parchment, they were good, next one did on non stick foil and Much Much better. nice and crisp all around. I will make again, but now no NOT to add the soda. Could have been much worse… glad I jumped out of the way or hands and feet would have been burned by boiling water. We noted to carefully add the baking soda. Sorry you had issues!! The pretzel recipe is all jammed together making reading it, a pain. Can you email me the recipe for the pretzel bites please!! There is a link right under the picture by the recipe that allows you to print it at home! That may be helpful! We were having some issues with our mobile site, but it is fixed now. Please check again. Sorry for the hassle! Oh my goodness. I made these pretzel bites tonight and they were delicious!! Watch out Auntie Annie’s!! These look so good! Do they have to be eaten right away or can they sit as part of the Super Bowl buffet? They can sit out! You might need to reheat the sauce. I wonder if coconut oil could be used to coat the bowl. I’m trying to see where I can reasonably substitute coconut oil for vegetable oil. Thanks for this recipe. I love soft pretzels. Since we live in a tiny town, there are no pretzel shop. Yes, you can use coconut oil! I don’t have a dough hook. Can I still use my regular mixer? Looks amazing! But what do u do if all u have is a triditional mixer? where is the cheese dip? The recipe is included below the pretzel recipe! Pingback: Game Day Food – First Comes Mrs.
Pingback: Superbowl Party Ideas: Essentials for an awesome Superbowl Sunday! My fiance and I just finished making them and they are wonderful and taste great! Thank you. Sounds great. Will try. But, any way to set up for printing without your fans wasting 12 pages of paper and color ink? Yes, we have a printer friendly option. Click the Print Recipe button underneath the photo in the recipe box. These were amazing!! Thank you for the recipe, the only change I made and was only because it was what I had on hand was to use sharp cheddar for the cheese sauce. Huge hit at a party and all were eaten! Glad the pretzel bites were a hit! hmm is so Delicious thank you admin for this recipe i’l try to cook the same !!! These came out to be really gross. I don’t know if I did something wrong, but they ended up tasting like baking soda with a nasty aftertaste. Too strong of a flavor for my taste. I’ve tried to make homemade pretzels bites many times. They always come out wrong. The bottoms cook too quickly and end up getting burnt. They also have a very odd taste, very unpleasant. I’m not sure what I’m doing wrong. Is the sugar necessary for this recipe? And if not, can it be replaced with honey or anything? Can I make these the night before and refrigerate them or will they get tough when I warm them back up? I’ve made these and they are awesome. Thinking about making for a party but won’t be able to have them warm… do they still work even if room temp? Pingback: Happy Birthday! – No Garnish, No Glory! I like this idea of pretzel “bites” – it seems easier for kids and adults too as the larger pretzel can be a bit awkward to shape, boil and bake and still maintain a nice pretzel shape. I have taught baking to elementary age children and with the pretzel shape they would often over-handle the dough such that it turned into a gooey mess! Adults would most likely feel better about snacking on a “bite” versus eating an entire pretzel. Great idea! I do not have a stand mixer with the attachments listed. This is my first time making this, so I need additional help. Can you freezer them before baking? Recipe likely yields too much and I’d love to stash 1/2 in freezer. Yes! You can freeze them before or after! Love this recipe!! I did find, however that 15 minutes was just a bit much for my little guys, so I cooked them for about 10 or so minutes instead. Maybe dropping the oven temp would be good too for next time I make them, but they taste great!! Thank you so much for this recipe! The pretzels are perfect – light and fluffy while remaining chewy and dense at the same time. I’ve made them as bites and also as “mouthfuls” ( twice the size). Perfect game time snack! Hi I wanted to make these. How much oil do you use? Also is the sea salt just to put in top and the kosher goes in the mix? Could I boil these ahead of time and when ready to eat put them in the oven? That may be a dumb question but I have a lot of snacks to make for a Christmas party and was curious! They look really good to put in with Christmas baskets. How long will the pretzel bites keep? can the ve frozen? They are best right out of the oven, but can be kept in an airtight container for a day or so. They can be frozen too! I have made this recipe many times, so thank you! Question: I prefer their taste fresh out of the oven. I want to make for NYE after an event my bf and I are going to. What pieces can I do ahead so that I can just pop in the oven once we get home and eat while we wait for the ball to drop? Do I have to drop in water right before putting in the oven? Or is that a step that can be done ahead of time? If not, is it OK to cut the pieces of dough and let sit until we get home and boil then before baking off? Thank you! 1/2 a cup of baking soda!? Wow, a bit much? What is the best way to store the leftovers? Thoughts on making this vegan? Could I substitute the butter with vegan butter, or do you recommend an oil of some sort? Thanks in advance! I haven’t tried making the recipe vegan. Let me know if you try it. Vegan butter might work?? Maybe it’s a longshot – but is there any way to make these babies gluten-free? I haven’t tried, but maybe an all purpose gf flour would work? Let me know if you try it! I only have salted butter on hand right now, and I am still to sick to go to the store. What would you recommend? These look really good and where nothing has looked good for awhile, I would like to make these. You can use salted butter, just reduce the salt a little. I hope you feel better soon! These look incredible! I’m totally making these for the super bowl on Sunday! Love the sound of homemade pretzel bites! Yum! I don’t have a mixer with a dough hook. How can I make these without one? Thank you! You can mix together in a bowl first and then knead the dough by hand. oh jeez- this look so good!! Okay, drooling. I loooove soft pretzels, and these look like absolute perfection. Not even sure I’ll be able to wait for game day to try these bad boys! Yummy! How many bites does this approximately make? Can these be made ahead of time?? Yes, we are making the dough today and boiling and baking them tomorrow. You can also reheat them. DOH! I forgot to get unsalted butter! Is it okay if I use salted? I made these today for the Super Bowl- They were delicious! I just made these this afternoon for the Super Bowl tonight and oh my gosh!! They are so delicious! I would maybe put them in the oven for 10 minutes and then check them and add additional time if needed because my first batch got pretty crispy. Other than that though, this recipe was perfect! Definitely trying these when the whole gang is together! I have seen this question asked a couple of times but haven’t seen an answer (without reading through all 688 comments): Can these be made ahead of time or are they best made on the day they are needed? Can they be frozen? If they can be, would it be best to freeze the dough before cooking, or freeze the finished pretzels? Thanks! These look amazing. I’m keen to try them. Is it possible to freeze them for a couple of weeks? Is there a way to make these without a stand mixer and mix and dough hook? Any alternate methods you would recommend? These Pretzel Bites are so good I’m going to make them again tomorrow. Along with some soft pretzels and pretzel twists. I volunteer at my Chemo Infusion U:nit to pay back all the love I received. The Bites were a huge hit in January and I’ve gotten several requests for a repeat performance. So, tomorrow is Pretzel Day in my kitchen!!!!! That is so nice of you to share the pretzel bites. I hope everyone enjoys them! 1,000th try at making homemade soft pretzels and this was the first time I got a passing grade from the kids. Thanks for the recipe and motivation! mmmm so good these are some of the best soft pretzel i have ever had! Pingback: There is always a reason to bake! Are these best eaten the day they’re made or are they still good after a couple of days? The pretzels were awesome, but the cheese sauce was not very good at all. I made these pretzels yesterday for a party and they were a HUGE hit! I also made the cheese sauce but didn’t end up using it because it turned out very thick/almost doughy. I used pre-shredded cheese since I had a lot going on and i’m wondering if that might have been the problem? These were perfect!!! Thank you for the delicious recipe! They were gone in minutes! I made these today with the cheese. They turned out perfect! I followed the recipe exactly and would change nothing. Great recipe! They look so cute! I have never made pretzels but I think i should give it a try. If i use instant yeast, will the method n qty be the same? Would an all purpose gluten free flour still work with this recipe? I was wondering if you have ever made them in advance and froze them after boiling them? These sound so yummy, going to try these soon! Thanks for posting. can we make this ahead? I want to serve these for my daughter’s school party very early in the morning and I’m thinking of making these the day before. any tips? Yes, you can make them the day before. Keep them in an airtight container and reheat in the morning in the oven. Yummy! Give me a bowl of mustard and I’m good to go. If I wanted to freeze them, at what stage would I do that? Can I make these a couple of days ahead. Doing ladies road trip and want to take these. Made it. Family loved it so much that I made them again 2 days later. O lyrics different ce is that I used a bit. Less than 1/3 rd baking soda. They tasted so good we didn’t need salt on top. Thx for posting! Oh my gosh! I just made these……and they are SO SO good. I never thought you could make a homemade pretzel, to taste like a pretzel, but I was wrong. Thank you so much for sharing this. They are DELIC. Anyone who loves pretzel’s like I do should definitely try this recipe. How are these cold? Or do they need to be served warm? How good will these taste if made the night before? They are best the day of, but still good the second day. What if you don’t have a mixer with a dough hook? These are easy to make and oh so delicious! I make these about once a week! Haven’t made it yet but was wondering if I made the dough the night before will it could me out the same? And how well do they keep? Can you make and freeze? Going to make them for school lunches. These are amazing …fresh out of the oven! Reminds me of the hot pretzels when I was a kid at the ice rink. They were the best.! Thank you for sharing this recipe. i’m trying your mexican dish next. I had never made pretzel dough before, but this recipe seemed very easy. I made it last night because I’m bringing them in for an office potluck lunch. I have to say, trying them fresh out of the oven they were just like you got them fresh at a bakery. I followed the recipe exactly and they came out great. I did not make the cheese dip they recommend because I used another recipe for beer cheese dip, so I can’t comment on that. The next day at the office party, they were a bit harder but that’s just the nature of soft pretzels. Since we don’t have an oven at work, I couldn’t freeze them and then heat them up at work (wouldn’t have had the pans anyway). Another note, this recipe is fun to make as a couple, too. My wife and I are newlyweds and making these was a fun, low-pressure activity for a Monday night. We made some memories and felt great afterwards because we made delicious pretzels. Not to mention the fact that since we live in a condo with thin walls, I got three texts from neighbors asking me if I was making pretzels. Two of them asked for the recipe! Funny stuff. My wife pointed out to me that it’s easier to get the yeast to combine if you mix it with the water and then add the other stuff. I am not an experienced baker and didn’t know this. I can’t say whether it works, but she tends to know her stuff in this area so I am inclined to trust her. Also, I would say you can make the egg wash during the time that the bread spends rising. The recipe says an hour but we waited 80 minutes. At an hour it had risen but not to double the size – that could be because I didn’t combine the yeast the way my wife said I should. Oh well. P.S. I think I may try this recipe again but instead of dividing it into 8 pieces I’ll divide it into 2 pieces and make us a couple of pretzel rolls for sandwiches. Wish me luck! These sound so good want to make for Christmas Eve do you think I could make the dough the day before? Can they be partially made ahead of time and baked a couple of days later? I used a standard mixer and a toaster oven since my regular oven went out just before the holiday weekend. They really turned out great and I had to adjust cooking times to just 13 minutes. I was so nervous making these for our traditional fondue christmas eve night that i made them the day before to test myself. They are amazing! For those who said they are soggy, I would suggest not putting them onto the baking sheet after coming out of the baking soda, so they aren’t sitting in water. I put 1/4 cup of baking soda in 4 cups of water. And I only put them in for 30 seconds. My daughter won’t stop eating them, I may have to make more tomorrow, just hoping they taste good the next day. I really just want to eat them all now. These were very good. Not too bad for my first attempt. They got really stuck to my pan though even after I used spray. The whole process is kinda lengthy, and they are best fresh out of the oven. Those are my semi complaints, if you can call them that. Family loved them so will probably have to try again. Thanks!! These were amazing, we ate the whole batch. One question, if you boil, season, then bake. How do you maintain the boil during the 12 minute bake time? We kept losing water level to the constant boil and would add more but then the baking soda ratio was off. Do you boil all first then bake all at the same time? Can this dough be made in a bread maker? Put first 5 ingredients in all at once? Or will that not work? I haven’t tried it in a bread maker, sorry. Perfect recipe for a snowy day. Can you freeze the dough before baking? The pretzel bites turned out fine, albeit very time-consuming to make, but the quantities for the cheese sauce have to be wrong. There is too much cheese for the amount of liquid, so the “sauce” ended up being a huge lump of melted cheese. After doing some research, I found two similar recipes which gave the quantities as two cups of cheese, two cups of milk, 1/4 cup of butter and 1/4 cup of flour. These ones worked. I made these for a party am making them again today. They were delicious and a big hit with my friends. I jazzed up the cheese sauce a little bit by adding a splash of Worcestershire and a little bit of dry mustard. I’m looking forward to eating these tonight! If I wanted to make this a day earlier, what would I do different? Do you think it’s possible to freeze the cheese sauce into discs so the pretzels can be stuffed? Like your peanut butter stuffed pretzels? Is there anything I can use instead of a small roasting pan? These sound great though! Can you keep the doe overnight in the fridge??? Hi! I followed the recipe and they turned out very bitter! Too much baking soda? Anyone else have this issue? I forgot to egg wash them the second time i made these little dudes, (all steps were followed the first time and they came out perfect, although id only leave them in for 10 minutes for a chewier nugget ) and little known discovery, this dough makes a perfect sister Schubert copy cat recipe. I’ve made this twice in the last week. Once for Superbowl and again today. First time making it I had a couple learning curves. This second time it came out absolutely perfect. My oven cooks fast so I only had to bake 11 mins. This recipe is so easy and sooooo yummy! I made the cheese sauce the first time and it turned out too thick. I didn’t make it this time, but I’ll try again sometime. I use this to get my teenagers to hang out with us in the same room on Saturday nights …. at least until they’re gone. I just buy the cheese raise. It’s easier and has better dipping consistemcy. she said, “For sharing” HAHAHAHA THESE ARE ALL MINE!!!!!! MINE! I made this today and did exactly half as I wasn’t sure of the outcome. Finally a recipe that works!!! They were so crusty outside and softer inside. Thanks for sharing!! Hi! I really want to make this! But your post says 1/2 cup of baking soda. The ingredients list says 1/3 cup. Which one to go with? Thanks! It’s 1/3 cup! I updated it. Thanks for letting me know. Unlocker is a software which is used to delete a file in Windows that can not be remove earlier. These turned out great- and the cheese sauce too! I would like to make these for a appy in 2 weeks. It made a lot of cheese sauce. Can I freeze the sauce? it would be lovely if I could make a batch of fresh pretzels and just whip some cheese sauce out of the freezer and bring to dinner. I have a couple other dips to name too. If not how long can it stay in the fridge? Came out great, rewrote the original recipe with no changes to cut out unnecessary wording. Baked at 420* for 10 minutes, because we’re at 1100 ft. Came out the best on my stoneware. Doubled. This was delicious recipe. I hope to make it again! Have you ever prepped these ahead of time to bake later? I am wondering if I could boil, then freeze, and bake when ready to eat. Or freeze dough bites and boil and bake when ready to eat. I made these for myself and loved them! Then I made them for my neighbor’s birthday party and I LITERALLY had people following me around as I walked the bowl over to the bar, because they had sampled them on my way in and wanted LOTS MORE! They went QUICKLY! The first time I made them, I didn’t bother with the cheese dip. But I made that for the party and it is a WONDERFUL dip for these pretzels. I’ve since made them a few more times and each time…people rave about them. I’ve shared your link MANY times. Thanks for sharing! Glad you like the recipe! Made these tester for my daughters birthday party. They were a big hit!! I actually had some pretzel salt from KAF. Sooo good!! These were so good! A hit! I get requests to make these everytime we have people over ! I did split the cheese dip in half, half as per recipe. The other half I added diced jalapenos. The jalapeno cheese added a nice kick! Can you freeze dough or finished product? excellent recipe everyone enjoyed the pretzel bites. Can these be frozen? If so, how? Hi! I plan to make this for Christmas. Is it possible to make the bites ahead and freeze them? If yes, should I cook the bites first or freeze the dough bites? Thank you! How long will these keep? Freezer? Do you think these would freeze OK? Anyone skipped the egg wash and salt part? And tossed the bites in melted butter after baking then sprinkling with salt? That’s how our pretzel place does it. I would assume it would work here also. Looks Crispy. I will definitely try at home though I am not good at baking. Just wondering if bread flour was okay to use in this recipe ? We make these every year for the Super Bowl and they are so delicious! The only problem is my cheese sauce. It’s always clumpy and gross. I follow the directions to a T. Any suggestions? I’ve tried shredded cheese and block cheese. Make sure the flour is completely mixed smoothly in milk before adding cheese. And freshly shredded cheese melts better than pre-shredded. Hope that helps! Is the dough able to be refrigerated overnight with no issues? I want to prep for the game tomorrow but do not want to ruin them! If making ahead of time at what temp would be good for reheating without drying them out too bad? I made pretzel bites during an ice storm. I had nothing better to do . I have to admit I had never even attempted to make pretzels. I loved the experience. Easy to follow directions. That does not happen with just skill or experience but a good recipe and easy to follow directions are vital for success . They tasted great. I took part of the dough and made pizza . It was great!. I will be using this recipe for my pizzas. These are absolutely amazing and only costed me $4 to make them because we already had the other ingredients. I would totally recommend these to anyone who wants some delicious mini pretzels! The only thing that I was concerned about is how you are supposed to store them do they don’t dry out, but I guess we will just have to see! Can you freeze and reheat or make them the day before? Looks fantastic! I will definitely try it and eat it with my family, will let you know how it went of course! I have made these a couple times now and they are excellent. The recipe is easy to follow. Everyone enjoys them and they make the house smell heavenly when baking. Made them this morning, So pleased so beautiful & good. Thank you. So SO good!! They look professional. They were really easy and fun to make. Thanks so much for the recipe! !